Kelly Miller started working for Interfaith Action of Greater Saint Paul in August 2015 as an intern for the Department of Indian Work food shelf. In April 2016, she became the Food Shelf Intake & Referral Specialist. In August 2016, she became the Emergency Services Coordinator. Kelly brings strong leadership and a year’s worth of previous food shelf work experience to this new role. “I work with our clients and make sure their emergency needs are met by giving them the information, resources, or food they need. It is rewarding for me to help Native American families in our community and provide these services to help them meet their basic needs,” said Kelly. Prior to working at Interfaith Action, Kelly worked for the Mille Lacs Band of Ojibwe in various administrative roles. She had an internship at Holland & Knight, in Washington D.C., and learned about Native American Law and also attended hearings of the Senate Committee on Indian Affairs. She was born in Waconia, MN, and grew up in Onamia, a small town outside of Mille Lacs Lake Indian Reservation. 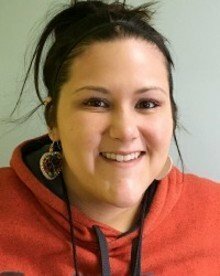 Kelly attended Fond du lac Tribal Community College, in Cloquet, MN. She currently lives in East St. Paul. When Kelly is not working, she is busy being a mom to her toddler daughter that she has with her boyfriend Terrence, doing family actives, and traveling to Mille Lacs area to visit with family.